The Criminal Minds season 14 finale is airing on CBS Wednesday night, and there’s a lot of good stuff to look forward to! 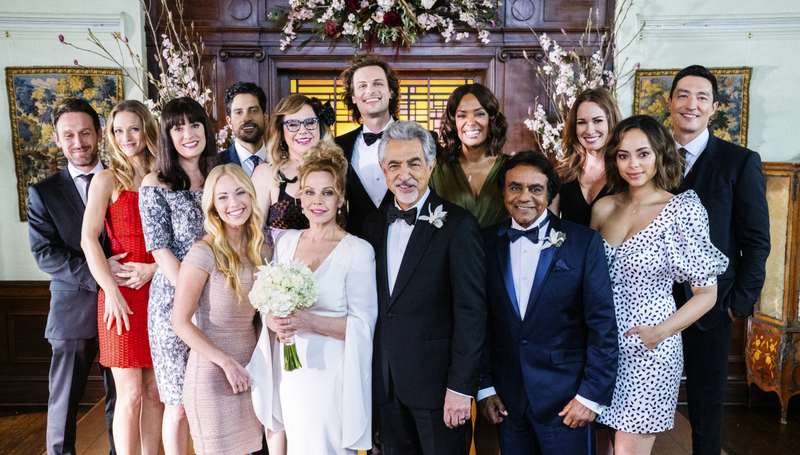 We have a dangerous case, a romantic wedding for David Rossi, and then also a fun guest star in Johnny Mathis! There’s also an ending that will leave you counting down the days until season 15 — but it’s not the same sort of Criminal Minds cliffhanger you’re accustomed to. Related Criminal Minds video – Be sure to check out some of our thoughts on the season 15 renewal in the video below! Also, be sure to subscribe to CarterMatt on YouTube for more Criminal Minds videos and take a look at our playlist. In part 1 of our finale interview, show executive producer Erica Messer tells CarterMatt about planning out the finale, setting specific goals, and also the decision to end with a wedding — plus, the fun story that led to the legendary singer Mathis getting on board. Check back following the finale for part 2 of this interview. CarterMatt – When did you start getting the idea for what the finale would be? Erica Messer – When season 14 got a 15-episode order, I said to CBS, ‘are you telling me that we’re only going to have 15? Are we done?’. They said, ‘as we’re sitting here right now, that’s not true.’ I then said ‘all I ask is that when it is true, you let me know’ and they did! I started asking if I needed to write the season 14 finale as the series finale or the season finale, and they said ‘season,’ I knew we were going to get more. These final ten — I don’t know when they’re going to air, but they’re going to allow us to honor the show in a great way. I’ve been here from the beginning and a lot of the actors have. There’s so much of this series that could be told for the next fifteen years (laughs), so it’s going to be hard picking some of our favorite things [to do] before going out the door. But we’re starting fresh and ended this season with this great wedding of Rossi’s with Johnny Mathis. What kind of goal were you and the writers hoping to achieve? We wanted there to be a solution, and a promise of more, because we knew that we were going to have more to tell. We wondered, ‘what are those final ten going to look like and how are we going to tee it up?’. We’re teeing it up in more of an emotional journey rather than just there being some bad guy out there tearing up the BAU — which is how we’re going to kick off the final ten. It just felt like emotionally, leaving the audience with something that we’ve never really introduced them to before felt like an interesting way to end the season and leave them wanting resolution. What went into the decision to end the season with Rossi’s wedding? Last year when we introduced this idea of the third wife, who he was only married to for 36 hours in Vegas, the chemistry between Joe [Mantegna] and Gail O’Grady was just so great. It was just foolish and bad timing when they did that then, but they could really be something now! When we ended that episode [last season], we knew we wanted to revisit it in some capacity. Then, we were looking at a 15-episode arc this season, I wondered if we could get Gail back for a few episodes, what if we end the season on their wedding? That always makes for a great wrap-up for the year emotionally, and it’s always fun to have our team laughing and dancing and having a good time because we don’t get to do that most of the year. It feels like by the end of the season, having the team relax and unwind feels so earned, as opposed to kicking off the season with that. Of course, the fun here is that we said to Joe, ‘which one of your famous friends wants to come guest star with us?’ (laughs). Back in the first episode with Gail O’Grady, we introduced this idea of Johnny Mathis being one of their favorites; then, when Johnny Mathis said he could do [the finale], it was perfect. That was such a joy to see Joe have a friend on set. Related News – Check out a promo new for the upcoming finale!